Fate/Zero on Glorious Blu-Ray – Everything is Oll Korrect! As one of the brave ones willing to shell out $370 for shiny discs, yesterday I finished rewatching Fate/Zero on glorious blu-ray. Since it’s a limited edition I don’t know how much longer it’ll be available, or if it is even now. For those curious, though, I figured I’d share my thoughts on how it turned out. I won’t say much about the content of the show, except, “Go watch it.” It’s an excellent series, and I’m looking forward to the second season, which starts in a couple weeks. Now, for the show itself, the animation has been touched up from the broadcast version, episode ten, “Discussing the Grail,” has been expanded, as has the final episode, and we get a brief look at the bloody results of Caster’s kidnappings. Fate/Zero looks great on blu-ray, with nearly theatrical-quality animation. The audio sounds good, too, as does Kajiura Yuki’s soundtrack. Though released by Aniplex USA, this set is the Japanese release, so there’s no English dub (no great loss), but the subtitle translation sounds natural in English, and my sister and I between us counted a grand total of two typographical errors and no grammatical mistakes, so not quite perfect but still a good showing. In a nice touch, the subs sometimes shift to the left or right side of the screen to avoid obscuring the art. I’m not competent to judge the accuracy of the translation, but I did notice one little oddity. 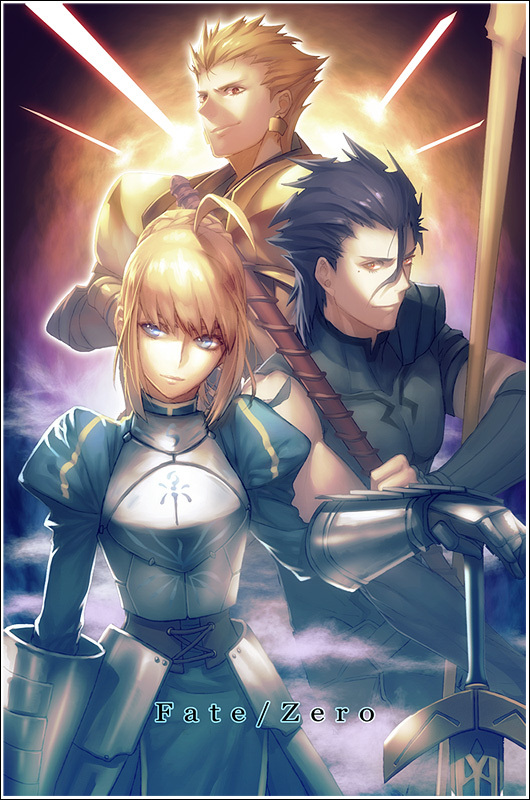 In episode seven, “The Dark Forest,” Saber and Lancer call Caster “gedou” (外道), which in the simulcast was translated as “heretic” but on the blu ray is given as “monster.” I looked it up here, and both seem to be possible, but I do wonder which, if either, is more accurate in this case. Given these characters’ backgrounds in Medieval Europe, I personally prefer “heretic,” but that’s a stylistic thing. The discs have a handful of bonus features. The first couple discs have a bunch of short promotional videos used for the show, which I don’t really care about, but I suppose some completists like these things. The rest each have a simply-animated cartoon of Irisviel and some girl who doesn’t wear pants (just bloomers and an athletic jacket), and I guess they’re explaining some of the backstory? I don’t know, because it’s untranslated and I could only understand a few phrases here and there. I realise this is a Japanese release and this cartoon is just a bonus feature, but I’d have appreciated some kind of translation. Aniplex also included a few other goodies. First, you get a drama CD, which is cool, but it’s untranslated, which isn’t cool. Next, you get a soundtrack CD. The music works very well in the show itself, and remains fairly enjoyable even on its own. Unfortunately, the songs used in the opening and closing credits are not included. Honest question: Are OP and ED themes not considered part of a soundtrack? The first volume of the Madoka Magica LE also did not include these on its soundtrack CD, even though one would think that these songs would be the ones most fans would want first. I’d love to have all of the music used in Fate/Zero, and I’m not sure why they wouldn’t include all of it. In any case, for the last bonus item, you get a fifty-page book full of interviews with the producer, director, writer, and several other staff members. It’s all in Japanese, but Aniplex USA provides a translation booklet which, one or two minor formatting mistakes aside, is pretty nice. Unfortunately, the translation booklet doesn’t fit in the box with everything else. The interviews are all lengthy and go into quite a bit of depth, so it’s great stuff for those of us who appreciate knowing how a show like this gets made. A couple final observations. The whole set comes in a nice, sturdy box. There are a few little slips of paper advertising merchandise and other shows, all in Japanese, of course, so it’s ineffective advertising at its finest for me. Now, was this whole thing overpriced? Yeah, probably. I’m happy with it, though, and will almost certainly buy the second season as well, once it becomes available.